Nike+ helps runners to keep track of their workouts, but what about all the activities in your day such as walking, dancing, playing guitar, etc., etc.? Wouldn’t it be great if Nike+ could keep tabs on that, too? 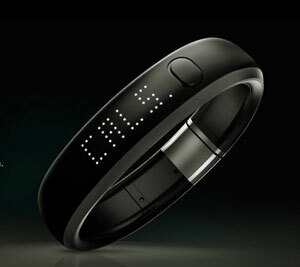 Enter Nike FuelBand, a life monitor that is neatly built into a thin, unobtrusive wristband that does just that. The Fuelband monitors your every movement and tacks time, calories, steps and something called NikeFuel – or points earned for activity. There are plenty of fitness watches and workout coaching tools, but none quite like this. Here’s how it works: You set an activity goal. As your NikeFuel points accumulate, lights on the wristband glow green to show you you’re approaching the goal, or red that indicates you’re too far off. Everything – calories, steps, time, NikeFuel – gets uploaded to the your iPhone or the Nike+ website via Bluetooth or USB, and you can check out your progress whenever you like. The FuelBand is available for pre-order for $149.